Doncaster Knights will battle it out with Premiership outfit Newcastle Falcons in their opening pre-season fixture at Kingston Park on Saturday. The game will be contested over four quarters with director of rugby Clive Griffiths planning to give his full squad a run-out in what is the first of the Championship club's three warm-up matches. A number of Doncaster supporters are expected to travel up to the game to get their first look at the club’s new signings. “It will be a bit of a mixed team,” said Griffiths. “I won’t be playing the team I perceive is likely to be starting the season against London Irish early next month. “I’ll be looking at various combinations of people I think might start against Irish in the next two games in the back-row and centres where we’ve lost key players from last season. “Obviously it was disappointing to lose the likes of Ollie Stedman and Will Hurrell because they both made a massive contribution to what we achieved last season. 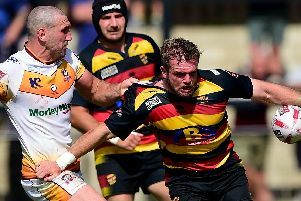 “But we couldn’t match the sort of money Yorkshire Carnegie were offering Ollie and we couldn’t really stand in the way of Will moving into the Premiership with Bristol because at 27 he might never get another chance. “Considering the fact that I left Doncaster to join Worcester the last time I was here I would have been a hypocrite had I done so. “Even though it is disappointing to have lost both players but it could have been worse and we’ve had to fight hard to keep other players, especially those who were in the Championship’s Dream Team. Although the Knights’ squad returned to pre-season training slightly later than usual due to the fact that the club’s 2015-16 campaign didn’t finish until late May, Griffiths says he is pleased with how things have gone so far. “Only time will tell if it has been a problem starting a bit later but Dougie (Flockhart) has done such a great job with them that the fitness levels were high anyway.